Abraham Lincoln was the 16th President of the United States. He led the country during the American Civil War preserving the Union, while ending slavery. He lived from February 12, 1809 – April 15, 1865. More facts and poems about Lincoln. 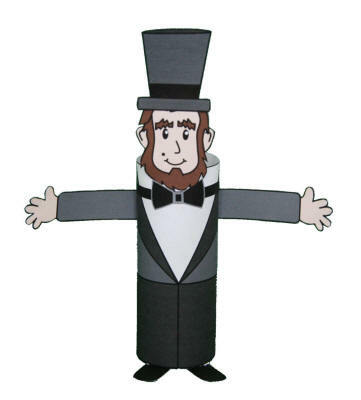 Abraham Lincoln is a fun and easy color, cut and paste craft that uses a toilet paper roll as a base to give the finished craft a three dimensional effect. Glue the bowtie around the top of the tube.